"Don’t forget in the meantime we have a real unemployment rate that’s probably 21%. It’s not 6. I’s not 5.2 and 5.5. Our real unemployment rate–in fact, I saw a chart the other day, our real unemployment–because you have ninety million people that aren’t working. Ninety-three million to be exact. "If you start adding it up, our real unemployment rate is 42%." Diamond runs down the list of what Trump might be thinking of. The headline 5.3 percent figure is the U3 measure of unemployment--the ratio of those who are looking for a job to those who have or want a job. There's also the U6 measure, which includes those who have some work but would like more, but that's only 10.6 percent. Diamond concludes Trump is probably thinking of the fraction of the labor force--those who have or want a job--that does not have a job, which works out to 37 percent. "Factor in Trump's tendency toward exaggeration, and that's pretty close to the number he quotes to TIME." Indeed. The percentage of the civilian population that does not have a job, according to official numbers. 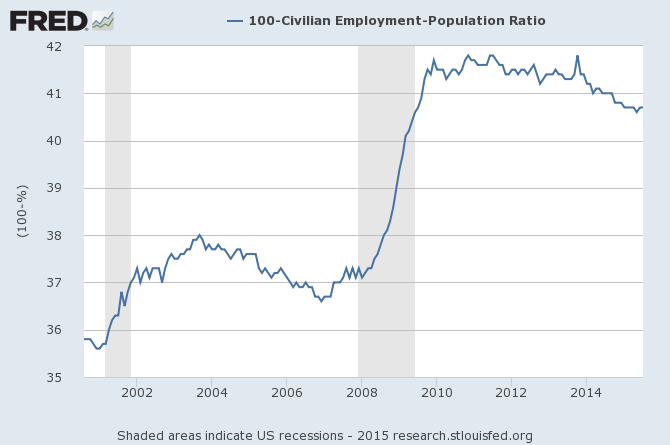 Just read Trump's quote again: "people that aren't working"--he's clearly talking about this employment-population ratio. The number is down to 41 percent now, but with rounding it was 42 percent as recently as 2014. Diamond is right that this is not the best measure of unemployment. Trump's measure includes children, the disabled, and retired senior citizens who don't work for reasons that have nothing to do with the health of the economy. And Trump understands that too--that's why his unemployment figure is 21 percent, he guessed that half of those who don't work aren't unemployed for economic reasons. Economists have given this issue a lot of thought which is why we've come up with a very specific definition of "unemployment"--those who want jobs but don't have them--to capture a more meaningful economic indicator. And the flaws with that statistic, which we are well aware of, is why we've come up with tons of alternative measures, like U6. I spend quite a bit of time communicating economics to non-economists, which is why I care enough about this to write a post about it. Non-economists usually aren't aware of these definitional issues and often interpret the headline U3 measure to mean the percent of the population that doesn't have a job. I'm frequently asked how many of the 5.3 percent unemployed are children and retired people (none!) and, when I explain the definition, everyone always want's to know the "real unemployment rate" by which they mean the percentage of people who are non-employed. The US has always been a bit puritanical, and (now that women are part of the workforce) people tend to think of this as a place where almost everyone is working full time--they are usually quite shocked at how large the ratio of non-employed people is, and this is exactly what Trump was playing to. So, yes, more than 40 percent of the population is not employed. Of those, 37.4 percentage points--over 9 out of 10 of Trump's "unemployed" people--are not in the labor force, meaning that they are not looking for work. They are children, retired senior citizens, the disabled, in prison, going back to school, wealthy enough not to work, and yes, some are "discouraged workers" who would be looking for work but don't think they can find a job. But of those who have a job or looked for one in the past month, 94.7 percent were the former.